Managing the 55,678-acre Downeast Lakes Community Forest is no small task. 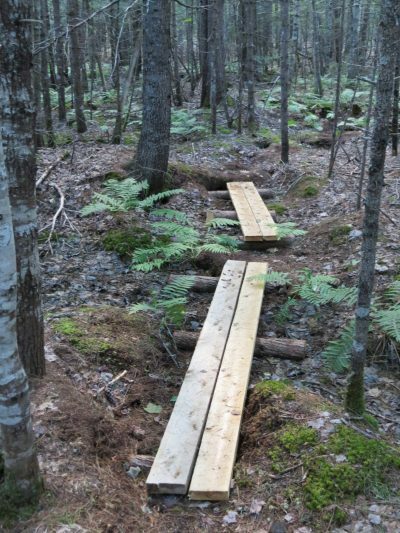 With numerous hiking trails to maintain, lakeside campsites to clean up, and small projects to check off DLLT’s to-do list, the many friendly faces of the Downeast Lakes region take pride in keeping the recreational infrastructure in tip-top shape. A core group of local volunteers are essential to community-led conservation, and they are making a huge impact. In addition to the many all-volunteer committees that help govern the Downeast Lakes Land Trust, a new group has formed that works to complete the many hands-on tasks that need to be completed throughout the year. The Friends of the Community Forest is an informal group that meets a few times a year during “Work Days.” Group members are notified via email, and there is no specific commitment necessary. At the most recent work day, volunteers completed a few sections of bog bridging along Tower Hill Trail and installed educational signage along Trail to Tomorrow. The hard work of these members is greatly appreciated, and they are truly making a difference in DLLT’s conservation work. And, volunteers occur at all ages! DLLT’s summer children’s programs are hard at work improving local habitat for birds of prey. The most recent installment of “Serious Skills for Boys & Girls” was a lesson in Owl Box Building. 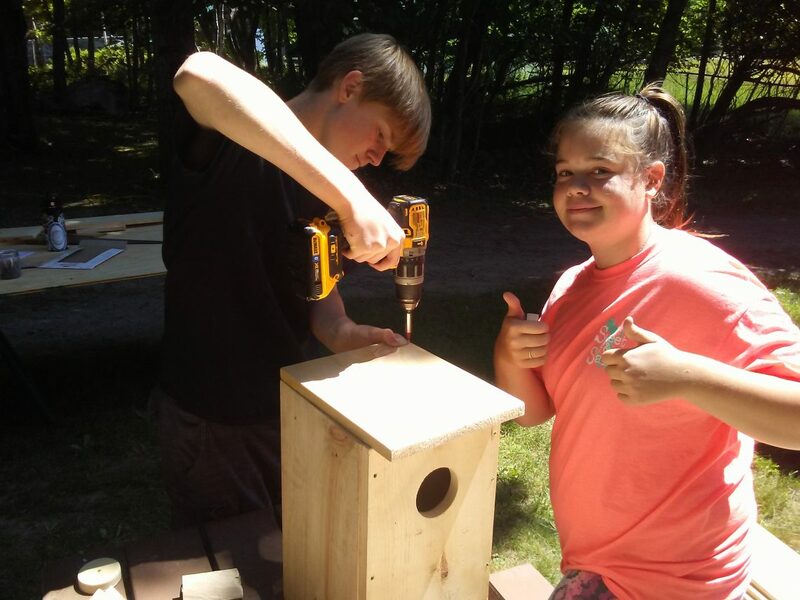 Armed with hand saws and screw guns, the kids built 6 nesting boxes that will provide suitable habitat for Eastern Screech Owl, Northern Saw-whet Owl, and American Kestrel in various points of the community forest. If you, or someone you know, is interested in joining the Friends of the Community Forest, please contact DLLT at (207) 796-2100, or email info@downeastlakes.org.